Enhance your Teams success by having them become Pragma Certified today! When you know what the caregivers are supposed to deliver, that gives you power to drive change. Inadequate medical documentation and poorly designed care programs can severely damage a case. Often health care providers do not understand the immense influence their level of personal injury knowledge is having on the settlement process. For legal staff, the substance of medical documentation is often complex, making it difficult for their value to be accurately assessed. 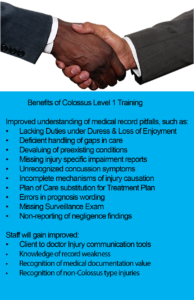 By becoming Colossus Level 1 trained, your staff will know what your client’s doctors should be focusing on in the medical records. This training will get right to heart of what ails most claims, the lack of validated injury evidence that insurer software is looking for. Doctors need to discover all injuries, employ severity-matched diagnostic testing, employ well designed treatment plans, and submit solidly built documentation. When these tools are not present the outcome is predictably lower than what your client often needs to avoid financial disadvantage in securing the best recovery care. Colossus Level 1 tools can be deployed with predictable outcomes. This training helps make settlement negotiations conclude faster and for more medical value, helping your clients get proper medical care reimbursements for their injuries. These tools provide guidance for your team to help them communicate more clearly with your client on their initial client. These tools help your staff convey the client’s injuries to medical professionals, providing clear expectations on diagnosis, therapy, and reporting tools. Physicians who are do not use the best methods of validated documentation and creating acceptable treatment plans will damage the claim value for your client. Just when you think you have a great case, you find out that the medical providers didn’t communicate with each other, often providing conflicting notes or under reported injuries, even negatively worded injury comments on the effect the injuries are having on your client. Without supportive injury care and treatment documentation, your client will suffer from financial disadvantage. Pragma Intel training courses help paralegals discover what documented injury severity should look, including solid medical evidence, compliant treatment plans and validated care, all of which should be designed to bring better settlement value to your client, helping them avoid the frustration and anxiety of worrying about how they are going to pay their medical bills. Improved injury severity and symptom discovery. My team works with thousands of medical records and they have seldom find a claim where the providers worked together for the common good of the patient. Yes, sometimes doctors “cooperate” in theory, but they rarely corroborate and strengthen each other’s findings. They don’t do that maliciously, they just haven’t been trained on the best ways to collaborate. Why? Because today’s general medical training provides a foundation for reporting healthcare issues (disease, illness), not personal injury (traumatic injury) care. You are making a strategic error if you think that healthcare understands how to effectively communicate traumatic injury to a liability insurer’s medical management software. Most physicians, regardless of training, routinely miss the important aspect of documenting all injuries and symptoms experienced by your clients from their injury event. Have your staff trained to recognize important injury symptoms and take action to get them documented and diagnosed by physicians and monitor your client’s treatment plans for adherence to accepted medical practice. 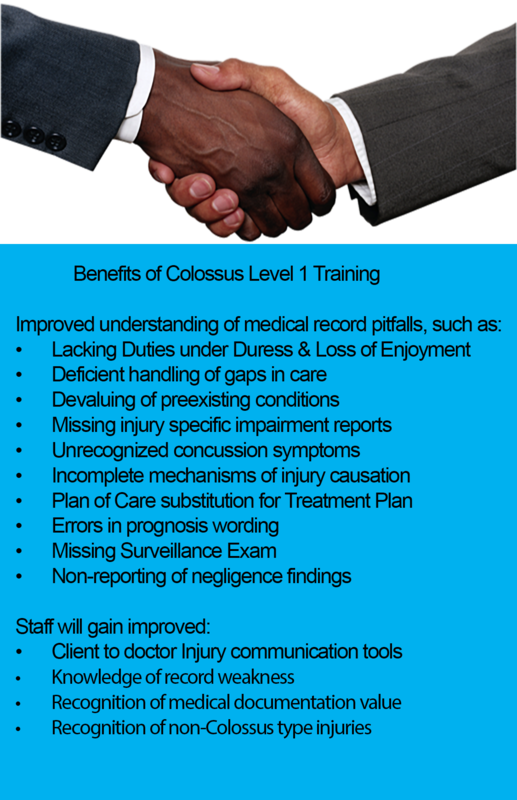 The Colossus Level 1 training course will show your team what your clients doctors should be documenting and what that looks like! With this training your team can hold providers accountable for what they should be doing, but only if they know what the basic requirements are. Many personal injuries do result in permanent impairments. Despite the prevalence of these severe injuries, many are overlooked and consequently not treated and not impaired by doctors of all license types. Without an impairment declaration an important part of your client’s medical value is lost. When you team understands that 93% of all car crash injuries result in connective tissue damage and that such damage is permanent, they will learn to look for and ask for impairment ratings on your client’s injuries. This is a key medical service that dramatically improves the settlement value for your client. What about future medical language in the documentation? Most doctors will commonly overlook future medical care and it’s cost, which negatively effects settlement offers. How does your team convey that to the doctors? When your team knows how to perform that estimation (and how easy it is), they will be able to confidently encourage the doctors to take the extra time needed to calculate future care and dramatically help your clients ability to get a just settlement offer. Training for doctors actually starts with training for your team. Once your team understands what doctors minimum documentation is supposed include, they are empowered to expect and demand more from the doctors who treat your clients. Find out more about training doctors by clicking here. The first module was worth the cost of the whole course. Such valuable information. This will set me apart from the rest for sure, and make me more valuable to attorneys. Every doc needs this material!